In this first post, we’ll be discovering what it’s like to travel to and around India. While transportation in India has changed since I first visited 20 years ago, travelling in India is still an adventure. The Adore Yoga & Ayurveda Retreat begins in the south-western state of Kerala and most participants fly in to Kochi International Airport the night before. As you travel between the airport and the nearby hotel, you’ll see a field of more than 46,000 solar panels gazing up into the Keralan sun. Kochi is the world’s first fully solar powered airport, producing 18 million units of power each year and reducing carbon dioxide emissions by more than 300,000 tonnes. Beside the field of solar panels, you’ll see roaming cows and barefoot farmers wearing traditional dhotis (short sarong like clothing). It’s your first, but certainly not your last, glimpse of India as a land of contrasts. Cutting edge technology sitting side by side with ancient traditions. The journey through Kerala to our retreat venue in neighbouring Tamil Nadu takes us through a chaotic jumble of bustling streets, whizzing tuk-tuks and business being conducted on every corner by street-food vendors, fruit sellers and make-shift hardware stores. Kerala is a lush tropical environment and the jungle always seems about to burst through as vacant lots become overgrown with banana trees, palms and bright green foliage. Looming from the sides of the roads are huge, white buildings with monumental concrete statues around them. “Look, a temple!” cried one of our retreat participants. But on closer inspection, the ornate building is a church. 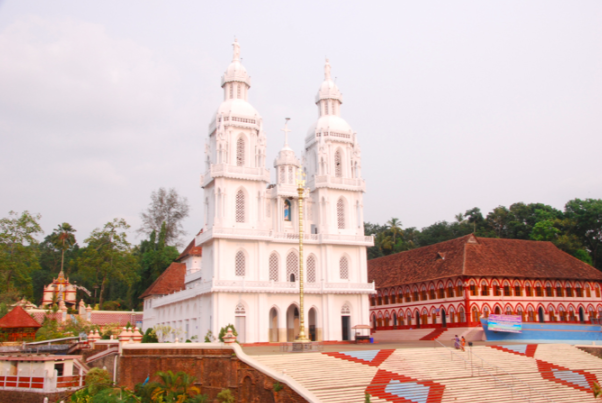 Nearly 20% of Keralans are Christians and they build their churches with a verve and enthusiasm that is uniquely Indian. We roll along in our little green bus (air-conditioned – I spent enough time in India in my 20’s travelling on windowless local buses), avoiding the traffic of the city centre and enjoying the newly built main road out of Kochi. Until it stops. One minute, it feels like being on a modern road anywhere in the world (albeit without any road markings…). And then the wide, smooth, sealed road abruptly ends and cars and trucks gingerly pick their way over a muddy track, weaving around road blocks, until we reach our turn off and head into rural Tamil Nadu. In case you were wondering, these are not temporary road works. It’s been like this since I first took this route four years ago. About two thirds of the way to our retreat venue, Maitreyi Vedic Village, we cross the border between Kerala and Tamil Nadu. We leave behind the lush tropical landscapes of coastal Kerala and move into the dryer and less built-up centre of South India. While we’re only a stone’s throw from Kerala, the language and culture is dramatically different. Tamil is one of the oldest surviving classical languages and the Dravidian culture here has remained largely unchanged for thousands of years. 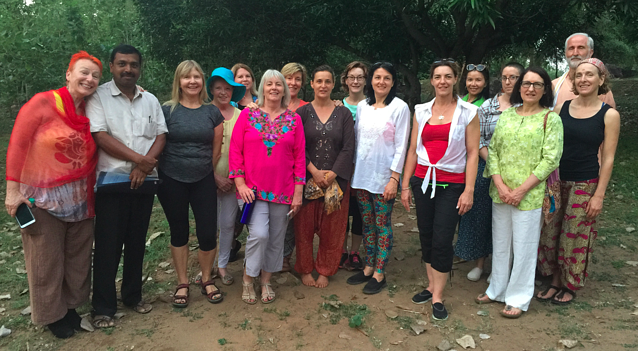 When we arrive at Maitreyi, the welcoming committee is ready. We are shown into the cool, shady interior of the wide stone-floor administration building. The pandits (priests) arrive and the blessings begin. It’s a joyful and emotional experience to arrive at a remote place in a far away land and to be greeted with chanting, incense, flowers, holy water and blessings. It feels like coming home. We leave the welcome ceremony with our tikka marks in place (they’ll be replaced daily and all our photographs of our time in Maitreyi show us with these distinctive red and ochre marks made with powdered sandalwood and vermillion on our foreheads). The next few days pass with very little travelling. We settle into a routine of yoga, meditation, ritual, Ayurvedic treatments, devouring organic Ayurvedic food, drinking coconut water in the little onsite café and relaxing in the stunning grounds on the edge of the Anamalai Tiger Reserve (we’ve seen wild elephants, but no tigers yet!) 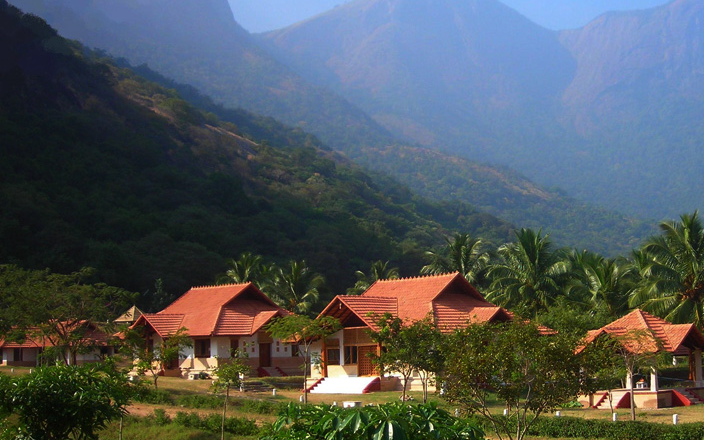 The foothills of the Western Ghats, a range of hills that form the backbone of South India, rise up into the cobalt sky beside us and dozens of peacocks make their way out of the jungle every day to peck at the grass and watch us as we meditate in the garden pavilion. Eventually we tear ourselves away and spend a day visiting local temples and an organic sari factory. Our guide is the co-owner of our retreat venue, Marcus. An Italian by birth, Marcus has lived and worked in India for decades and is regarded as a Hindu holy man in the area. With his white beard, simple white dhoti and gentle twinkly eyed demeanour, he certainly looks the part. Marcus shares his deep understanding of Hinduism and local culture as he helps us navigate the different buildings of each temple compound, explaining the symbolism of the statues and artefacts and helping us get the ‘temple etiquette’ right. These are local temples and there are no tourist buses in sight. In fact, we don’t see a single Westerner other than our own small group during our time in Tamil Nadu. 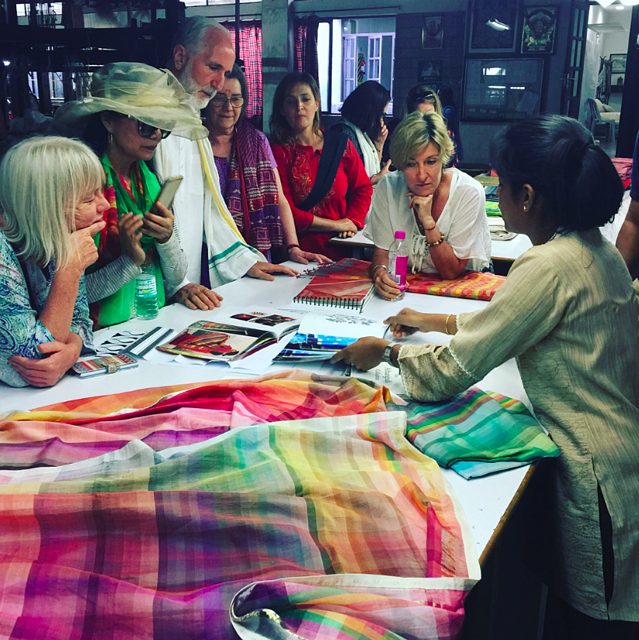 The sari factory is a real adventure. This centre only uses organically produced cotton to create the most beautiful fabrics on traditional hand-looms. We visit the factory where local men operate rows of huge wooden looms while their wives and daughters sit on nearby rugs and complete the delicate work of hand beading, plaiting and knotting the edges of the more decorative pieces. There’s a traditional ‘bicycle’ loom and stunning ‘look books’ showcasing the designs of fashion students from the nearby university who complete their internships at the factory. After a week at Maitreyi, relaxing far away from the crowds and hawkers of more touristed parts of India, we get back on the little green bus and return to Kerala – this time to the old colonial town of Fort Kochi. Fort Kochi is old. It feels like rambling around Renaissance Europe and many of the buildings date back to the Portuguese occupation in the early 1500’s and the later Dutch buildings from the 1600’s. It’s a coastal town with a city beach that is loved by locals and tourists alike. Every morning, the beach and its boardwalks are packed with people jogging, swimming, playing soccer and hanging out. Just around the corner is the harbour where you’ll see the traditional Chinese fishing nets, great 10m high wooden structures that have been used to feed the residents of Kochi for hundreds of years. The old town itself is compact and pedestrian-friendly, populated by shops, market stalls and cafes. There are broad tree-lined boulevards and narrow alleyways, each with its own character and eye-catching street art. Fort Kochi combines the ancient and modern, with 500yr old buildings housing art and fashion collections by young up and coming designers and modern cafes serving international dishes spilling out onto ancient streets. This is where everyone does their shopping – from textiles and jewellery to spices and statues of Hindu deities, everybody arrives at dinner after a day in Fort Kochi with bags full of gifts and souvenirs. Fort Kochi is also a cultural centre where we watch a traditional Kathakali performance, an exhilarating mixture of dance, mime and theatre with lavish costumes and make-up. 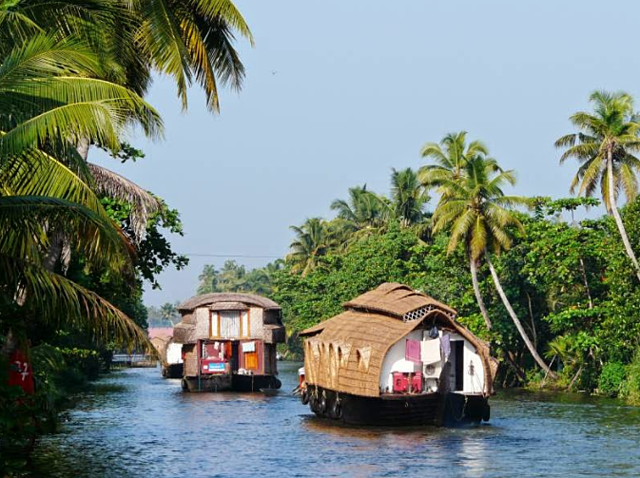 Kochi is where the famous Keralan backwaters begin and there are two must-do ways of seeing this extraordinary natural phenomena – by boat and by bike. The bike route takes you along the narrow pathways between the channels that make up the backwaters and it’s an opportunity to get up close to the people who live and work beside the waterways. The traditional house-boat option is a more chilled way to see the backwaters as we cruise through narrow waterways until we arrive at the vast natural ‘lakes’ that stretch out to the horizon. Some of our retreat participants choose to stay on in India for a few days, travelling north to visit Delhi and Agra, the home of the magnificent Taj Mahal. The rail and air connections from Kochi are excellent and our travel agent helps participants find the right connections, tours and accommodation for their ongoing journey – the internet has made travel in India a lot easier than my first visits back in the days before smart phones and Trip Advisor. India is a vast and vibrant land of contrasts and a surprising mix of ancient and modern. I never get tired of visiting India and the more I learn more about the country, it’s people, customs and traditions, the more I learn about myself. Travel in India is truly an enlightening experience. Adore Yoga are the experts in yoga retreats and travel, sharing stunning retreats in Bali, India and Australia since 2012. Our next visit to India is for the Meditation Teacher Training, 4-13 November 2017 and places are limited.